Family owned and operated decorative concrete landscape curbing company. We can take your old tired plastic or brick edging and transform it into a beautiful one piece continuous concrete curb. We can even offer various colors and patterns to fit your particular style. Transforming your landscape can be as simple as adding a decorative concrete curb around your home’s flower beds and shrubs. There are many color and pattern options available to choose from, giving you the opportunity to be creative when taking your yard to the next level. First, the sod cutting and ground preparation is completed, which makes the landscape ready for curb installation. This is done using our sod-cutting machine that cuts a 9" wide strip of sod. Then, we use square shovels to remove grass and level the ground. Once the ground preparation is completed, we are ready for concrete curb installation. Second, the concrete is mixed on a self-contained trailer and your choice of color is added to the exact measurement for the job. Once the concrete is mixed, it is wheeled to the site, fed into the machine and extruded into a beautiful continuous concrete curb for your landscaped area. The crew will then finish out the curb, depending on the type of curb you are installing, using trowels or a stamping process to finish the installation. As an added precaution, ground movement control joints are cut into the curb approximately every 12-18 inches to add flexibility to a very strong reinforced curb. Most job are completed normally in 1-day. 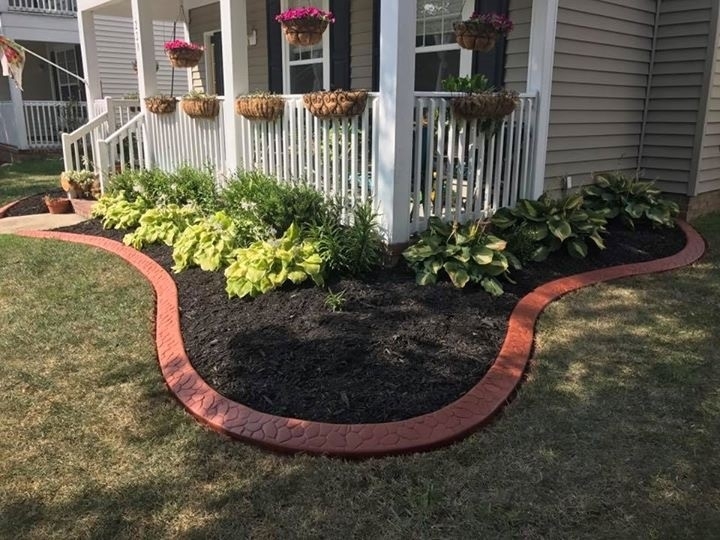 When Linke’s Concrete Creations, LLC has completed installing your decorative concrete curbing, your landscape area will be as clean as when they arrived. The owner of the business will be onsite for final inspection of your concrete curbing. Are you looking for something unique and hand-crafted here in Michigan that will complete your backyard landscaping or make your lake home even more beautiful. Look at the New Decorative Concrete Fire-Pit. Take a look at the unique design, which has been hand-carved just for you, in the shape of the Michigan Mitten or the Detroit English D. You can’t find this hand-crafted art in your local stores, as it’s truly a one-of-a-kind design, hand-carved, shaped and stained to look like a natural rock form. Our designs currently are all Pure Michigan. The cost for our Pure Michigan fire pits is $545.00 which includes delivery and installation within 50 miles of St Clair, Michigan. For distances greater than 50 miles please call for a delivery and installation estimate. 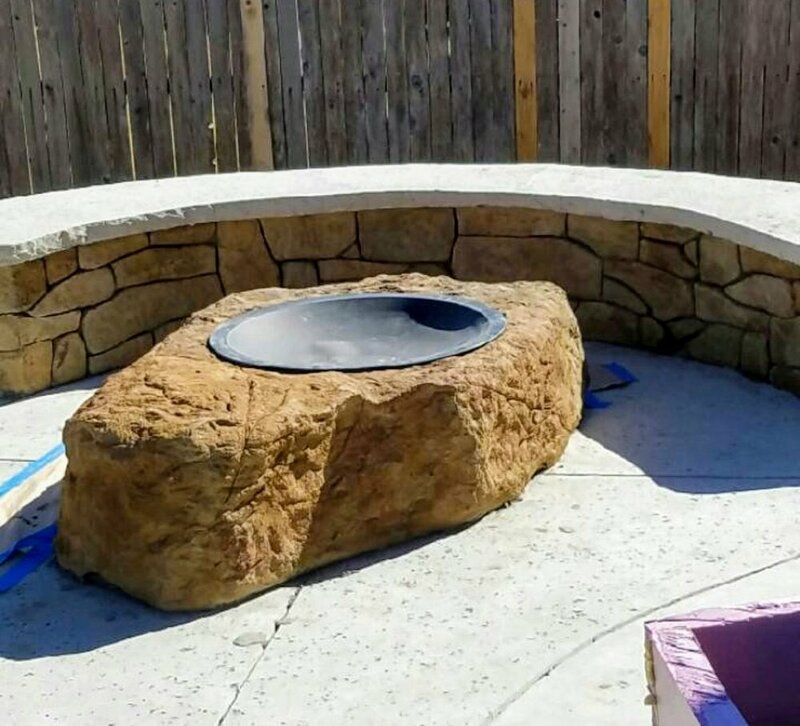 Each fire pit measures 3.5ft wide x 4ft long x 18inch high and weigh approximate 150lbs. We offer a pickup option for our fire pits but it will require an open bed pickup truck. We will load the product into your pickup the buyer assumes all responsibility for damage to the vehicle and fire pit once loaded.